Prima facie, alcoholic coffee seems a weird thing, not to say an old thing. 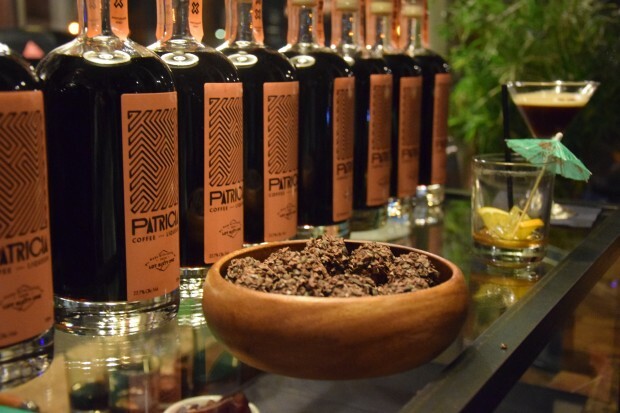 When I heard about Patricia Coffee Liqueur, I was so intrigued that just I had to go to the launch evening to taste it. It took place at Lot Sixty One, known for their perfect roasted coffees that Peter uses in his Patricia liqueur. He combined his passion for excellent coffee and strong alcohol to bring Patricia to life. A real taste experience! Before Patricia, Peter was a lawyer in Australia. He decided to start from scratch to dedicate his life to his passion. He did an apprenticeship in pastry in Paris before realizing cakes for Lot Sixty One. This second one-man business didn’t make itself; Peter had to try hard (almost two years!) to find the right combination of all ingredients. He mixed the locally roasted coffee from Lot Sixty One with local Amsterdam spirits and a blend of spices, caramel, and aromatics to make Patricia Coffee Liqueur’s recipe. Some Genièvre, Calvados, and Canella, a bit of lemon or chocolate, and there’s a good coffee cocktail! Moreover, you can use it for cooking like Peter did. To describe his creation, Peter says that it’s “seductive”. And according to the guests, it seems so: “It’s amazing, it brings the coffee out and it’s sweet, but just enough.” Indeed, his liquor isn’t just a hint of coffee or alcohol, but a mix neither too strong, nor too sweet, but perfectly in between. Patricia is the story of a mysterious woman that nobody knows. Patricia just started out and isn’t available for sale to the public yet, but you can follow the Facebook page or Instagram to stay up to date!